Time for some bontegames news! You probably all know Factory Balls. It started as a quirky Flash game with a handful of levels. Factory Balls is getting a big PC release! With a new design, new balls, new tools and loads of levels, 221 levels! 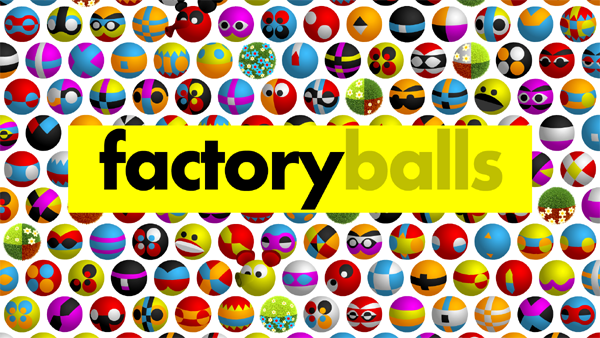 So yes the big news is that Factory Balls is coming to Steam soon! And you can wishlist it here! Yes! Bring it on! Take my money, I don't want these balls on my phone, I want them on my pc! Well I must say it felt great to design something for a BIG screen for once. I can't wait. I love Factory Balls! Thanks Bart! Hey, awesome! Will it be available through a platform other than Steam too though, and for Linux? Cool Bart, making a mental note for early May! It will be available for Windows and Mac on Steam but also on DRM-free sites, I'm thinking about Itch.io and Kartridge now, but maybe there are others? thanks, bart, for all you do! Hi, Bart. Love your Factory Balls games. Have gone back to replay them many times. Can't wait! Excited to try new levels! I am anonymous, but I am real and I love all you do, Bart! Thanks for everything you do! Will you add achievements and trading cards in this game (steam version)? Like, having a Factory Balls profile background or emoticon sounds pretty cool. Yes yes, all of that is planned for the Steam version! so in the steam version will it be all your previous levels plus a small amount of new ones levels or will these be all new levels. i dont want to pay for a game twice if i already have it downloaded on my phone. This Steam version is completely redesigned with completely new levels compared to the Flash browser versions of the Factory Balls games, but it is indeed very similar to the paid mobile version. All 164 levels that are now in the mobile version are a part of the 221 levels of this Steam version. Eventually the mobile version will also get the new levels.